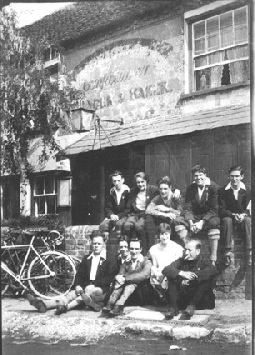 The PRIMROSE WHEELERS was a cycling club that flourished in the period between the end of World War 1 in 1918 and the start of World War 2 in 1939. At least 8 members of the MARKS family were members. Hopefully, the following photographs and reminiscences will give you a feeling for the spirit of the Club. On Sunday 10th October 1999, my wife Janet and I drove to Harrow for lunch with my cousin John and his wife, Finola. The guest of honour was Cis Taylor. Cis is a grand lady of 92 years young. Cis is the last known survivor of the Primrose Wheelers. If like me you are an “orphan” in the sense that both your parents have died, then, you too, probably bitterly regret not sitting down with them to ask all those questions about the old days. Cis was to be the nearest we would ever get to a second chance. After Finola’s generous helpings of soup, roast pork and pud we all plonked down in the lounge for coffee and prepared to listen whilst Cis, “Sang for her lunch”. We had managed to borrow a few old photographs and Cis had brought along her album too. These were sufficient to prime Cis’s pump and the reminiscences started to flow. We ranged far and wide but what follows, is my attempt to put our afternoon strolling down memory lane into some sort of order. 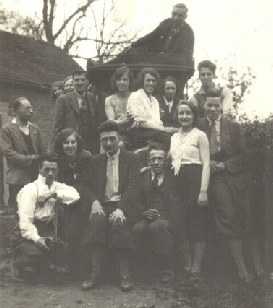 The Primrose Wheelers was a cycle club that flourished between the two World Wars. 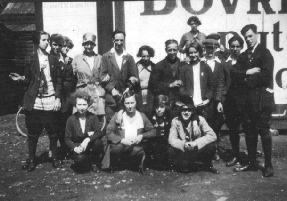 Like the years it spanned, 1918 to 1939, its members were both young women and young men whose ages ranged from their late teens to their 30’s. The Club had a social side and a racing side. The club-room, for most of its life, was a room over the bar of a pub called the Windsor Castle in Harrow Road, West London. Originally the club-room had been in a similar room in another pub, (possibly called the Alma), further up Harrow Road opposite the end of Sixth Avenue nearer to Kensal Green. Alas, they were thrown out from there because they did not order enough beer! The Club members were all what would now euphemistically be called Working Class people. Membership numbers are unclear but sufficient so that for most social cycle rides around 15 - 20 people would be involved. Looking at things through Cis’s eyes, they started with her friendship with Helen Marks née White when they were at school together. Helen was my aunt and the mother of my cousin John, our host for lunch. Helen and Cis saved up to buy bikes and as teenagers, would after work, cycle from their homes in Muswell Hill to a particular part of Hyde Park where cyclists used to congregate. Surprise, surprise, our two girls were more interested in the young men than the bikes there. The initial interest in cycling grew and savings were invested in upgrading their bikes by the addition of drop handlebars and other essentials of the time. The social side of the club was mainly a ride out on a Sunday or sometimes for a weekend, but we have to be careful of the definition of weekend. A Sunday run would involve anyone interested meeting at an agreed start point on a Sunday morning. Then, led by the Club Captain, Ernie Newman in the earlier years and later George Roberts, (known as Bob within the Marks family), they would set off for their chosen destination. 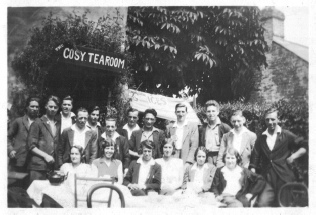 Cis had become the Club Secretary and her task was to write beforehand to a suitable pub or tea-room at their destination and order pots of tea to have with their lunchtime sandwiches. They could not afford to buy lunch and always took sandwiches. Cis also ordered tea for everyone at 5.00 or 5.30. Afternoon tea was cakes and tea and cost 1/3d each. That is one shilling and three pence or just over 6p. Bearing in mind that the members all lived in the Paddington to Muswell Hill part of London, destinations for the Sunday rides were chosen accordingly. They would set out in the morning led by the Club Captain, riding two abreast with little or no traffic by today’s standards. They would arrive at their chosen destination in time for their sandwich lunch washed down with the pre-booked pots of tea. Then leaving their bikes behind the pub or tea-rooms, off they would go on foot to enjoy the afternoon; tea at 5.00 or 5.30 and then the ride home. Ifield was always Cis’s favourite for tea because they would get a big plate of buttered toast too. Sunday destinations included, Ifield in Sussex, Chessington in Surrey, Haddenham in Bucks, Wendover in Hants, Tetsworth in Oxon, Maldon in Essex and Hertingfordbury in Herts. From this small selection of rides you can see that they ranged far and wide. Of these destinations, each, as the crow flies, is at least 30 miles from the start point so they were looking at a round trip of around 70 miles for the day plus their personal journey from and to home. We have photographs of the group at Uxbridge in 1927, Haddenham in 1928, Chessington in 1930 and Ifield in both 1928 and 1931. The over-riding impression from the photos is one of a happy-go-lucky group of people. 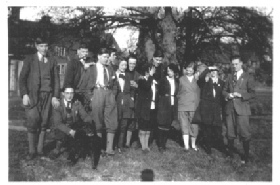 Both sexes wore long socks, plus fours and the men a shirt and tie. In the winter they wore heavier jackets but in the summer light cotton style jackets and open necked shirts and blouses. These Sunday rides are enough to make me feel faint at the mileage involved but the weekend trips do not bear thinking about. My mother used to work until 12.30 on a Saturday. My father would meet her as she came out of work and have her bike with him. They would hurry off to meet the group then cycle down to Portsmouth. There they would catch the ferry to Ryde, (on the Isle-of-Wight), and cycle across the island to Shanklin. Here they would camp for the night in America Woods about a mile from the sea. Sunday saw the return journey usually arriving home around 10.30 at night, in time for work the next day. As if that was not gruelling enough, Cis told us that she worked in a shop and shop hours on a Saturday in those days were 8.30 in the morning until 9.30 at night. At 9.30 she would be met by Alf, her future husband, and off they would set to meet others at Kingston and then on down to the Isle of Wight to meet up with the main group. We have photos of them in Shanklin and on the beach taken in 1931. The men's 25 mile race was 12½ miles out and 12½ miles back. They used a fixed wheel and only one gear, none of this Sturmey Archer or de-raileur business. A second back wheel would be carried, fixed to the handlebars on a bracket so that it sat alongside the front wheel. This second wheel would have a gear on it of a different ratio to the wheel fitted on the bike to start the race. What amazes me is, if weather conditions were such that coming back you might be say, riding into the wind, then at the turn around point at 12½ miles, the back wheel would be changed to get the benefit of the more suitable gear on the way back. What astounded me was that my father and others would clock up a time including wheel change for the 25 miles in just over the hour, a time only a few minutes slower than achieved today. There was also racing around a banked cycle track. My father and his brother, my uncle John used to take part in tandem races. I could recount you tales galore of their exploits that would range from tandem racing on the track, to evening encounters with a policeman over cycle lights. Also to my aunt Edith who, although terrified of the creatures, regularly managed to hit a succession of cows crossing lanes on their way to milking. Let me share with you one small tale, which to me, captures something of their spirit. Seeing this large group of cyclists approaching at the end of this hot day, his eyes light up. They all stop, he leaps down ready to do business. “Have you got any left mate?” he is asked. “Have I got any left - I have got plenty!” he replies. “Then it is your daft fault for bringing too much out with you!” At which they all mount up and start to ride away. Timing their departure and leaving him just long enough to go from puzzled, through crestfallen, to dejected, they wheel around and return laughing to buy from him. When this tale was relived many years ago, partially for my benefit, those present agreed every detail of the story except, was it Farnham or Cobham? - and - who was it asked for a discount for a bulk purchase? With hindsight the Primrose Wheelers was a very efficient matchmaking enterprise. 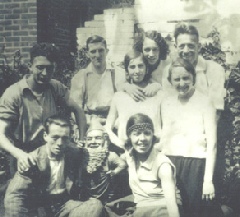 My father, Albert, was one of eleven surviving children and he, one brother, John and two sisters, May and Maud, were club members. All four married club members and all the marriages were literally until death us do part. Not that death did part in reality. Such was the strength of the bonds forged way back then, that when they retired three of the four couples all moved to the Isle-of-Wight. 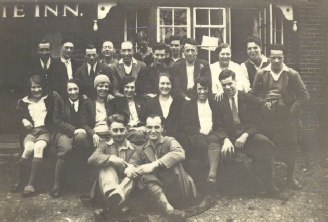 My parents, Cis & Albert, moved to Shanklin, literally across the fields from America Woods, and my two uncles, John and Bob plus respective aunts Helen and Maud, to Lake and Sandown. All six lived within a couple of miles of one another. Today all six are tucked up comfortably in Shanklin Cemetery in 3 adjoining graves bound together, as in life, by one white marble kerb surrounding all three graves. …………Cis Taylor is still alive, but now living in a home. Her short-term memory is completely gone, but one can still sustain a conversation with her by triggering her memories of the past! I shall take a copy of your article when I visit her this afternoon, though I doubt whether she'll be able to take it in. At any rate Mike and Ron Taylor will be interested to see a copy, so I will pass one on. All the stories you related about the Primrose Wheelers I have heard from Cis on other occasions, so it is a true record of what happened. Some stories (e.g. the one about being thrown out of the pub because they didn't order beer) were also told to us by John / Helen Marks before. Thank you for all your efforts. …………..
………. Did I tell you that Cis Taylor died recently? Such a shame - she was our last link with John & Helen but she certainly lived her life well. Our last living link with the Primrose Wheelers has gone and we are left with good memories and mementoes.